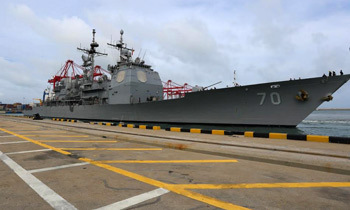 U.S. Embassy Chargé d’affaires Robert Hilton welcomed USS Lake Erie on its arrival in Colombo today with embarked U.S. military personnel to support humanitarian assistance efforts across flood-affected areas across Sri Lanka. Because of the long-standing friendship between the United States and Sri Lanka, American forces are able to respond with critically needed capabilities. In addition, U.S. Pacific Command will soon send military aircraft and other specialists to assist with disaster relief and risk reduction. “Whether it’s rehabilitating flooded areas and schools or providing food and water, our sailors are well trained for this mission and we are ready to provide relief and assistance to the people of Sri Lanka,” said Capt. Darren McPherson, commanding officer, USS Lake Erie. The U.S. military has a history of successfully working with international relief organizations and host nations to provide relief to those affected by disaster. In the past year, U.S. Pacific Command joined the Sri Lankan military for multinational assistance programs in both Jaffna and Hambantota, providing medical training for first responders, school renovations, and health clinics to surrounding communities. In addition, civil affairs officers from the U.S. and Sri Lankan militaries have partnered over the past three years to host a series of disaster management and coordination training workshops, bringing in civilian and military experts from across the region. All of these visits have been instrumental to establishing relationships with the Sri Lankan military and civil service agencies, allowing U.S. military personnel to efficiently respond when needed. USS Lake Erie left her homeport of San Diego in May 2017 on an independent deployment to the Western Pacific.